The Sun is our nearest star at a distance of 93,000,000 miles. While the sun and moon look to be the same size in the sky the sun is 400 times larger than the moon which means it is 400 times farther away than the moon. The Sun goes through an eleven year cycle where its magnetic poles reverse. These solar cycles cause changes in the number of sunspots and solar activity. 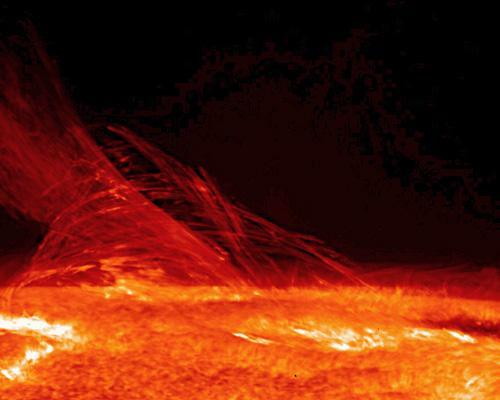 This solar activity has a direct impact on earth and its climate. Corona - The sun's atmosphere. Visible during a total solar eclipse, the corona is hotter than the surface with a temperature of 500,000 K.
Photosphere - This is the visible surface of the sun. It is not a solid surface, the sun is gaseous from its corona down to its center. 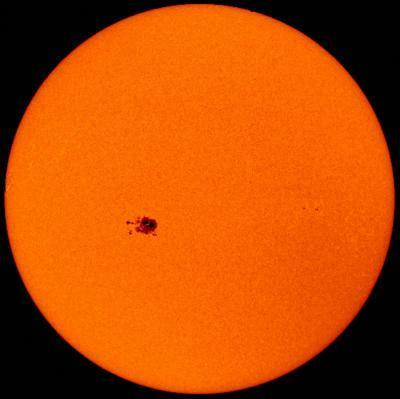 The average temperature is 6000 K with sunspots being a little cooler. Core - This is where nuclear fusion occurs and the sun produces most of its energy. The core is 150 times more dense than water and has a temperature of 16 million degrees.